In a first detail preview at Planet Steam, we get a look at the most important part of the game: extracting resources, your way to wealth. See how to stake your claim, and how to extract and convert resources – if you don’t know it already, Planet Steam is, after all, not an entirely new game but a new US release. The Elder Sign expansion Unseen Forces doesn’t only renew the museums entrance area and add new challenges to the game, it also adds new visitors. From both sides of the gate. I really like the flavor text for Jim Culver, by the way: a necromantic trumpet is pretty awesome. Corné van Moorsel and his company Cwali are trying their hands at crowdfunding now. Corné’s games have already been known for their small print runs and extra-cute handmade components, and now instead of mainly selling in Essen, Leelawadee will use the power of the Internet. The power of the Spieleschmiede, to be more specific. 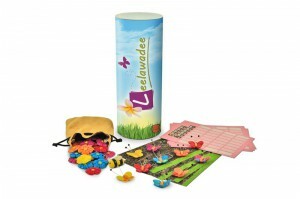 Leelawadee is a flower-planting game with rules simple enough to play with children, but I’m sure everyone will enjoy playing with the handmade flowers, butterflies and bumblebees. If anyone here speaks Dutch: does Leelawadee mean anything or does it just sound nice? Whoever said that there is nothing interesting left to do with worker placement must have forgotten to tell this to Nikolas Sakaloglou and Sotiris Tsantilas, because their Archon: Glory and Machination – currently on Kickstarter – does some interesting things. While it starts out as a pretty regular worker placement game, you can upgrade your workers during the game, giving you interesting strategic options: they might either collect twice the resources per action, let you play a second worker right away, ignore the limit how many workers can be in one location or, some mean interaction there, force other players to pay you for picking the same action after you. This year is turning more and more into the year of Stefan Feld: after Bruges, Rialto and Bora Bora Queen Games just launched a Kickstarter campaign for a fourth 2013 Feld game: Amerigo. Surprisingly, Feld does not continue his love affair with new ways to use dice and includes the much more unusual cube tower instead: you drop a handful of differently coloured cubes into the tower, and some of them, plus some from the last round, pop out at the bottom, determining the actions available in this round. You might know the mechanic from combat Dirk Henn’s Wallenstein, another game by Queen Games. In this somewhat predictable but mostly random way, you settle the Americas. This news item is a bit of a novelty, but please bear with me for a moment. Cryptozoic is currently looking for funding on Kickstarter, not for a new boardgame or card game, but for a computer game. Like I said, a bit of a novelty because we don’t usually talk about computer games here – although, as you know, I play everything that can be played, obviously including computer games. What makes Hex: Shards of Fate interesting for me is that it will be a massive multiplayer online trading card game. For some of you, that may be enough to damn it already: not everyone enjoys MMOs, and I know many people who despise TCGs. I’m not so prejudiced – like I said, I’ll play anything at least once – and I’m very excited by the concept: taking a card game and extending it with digital concepts, it’s one of those things I keep wondering if they can work, and so I’m very curious to see if this one will work. And even if all that means nothing to you, at least watch the project video to see just what Cryptozoic president Cory Jones would do to get this thing funded, it’s really fun. This week’s featured image is another one that doesn’t really need an introduction: it’s Uluru, better known as Ayers Rock, in the Uluru-Kata Tjuta National Park in Australia. The photo was taken by Joanna Penn and shared with a CC-BY license. Thank you, Joanna!